World Health Organization recognizes the need for traditional and alternative medicine, and launched the WHO Traditional Medicine Strategy 2014-2023 to bring forth the benefits of putting alternative medicine to good use. According to a report by the strategy, in Asian countries like Singapore, and Republic of Korea, 76% and 86% respective populations commonly use traditional medicine despite having a well-established healthcare system. Essential oils are an important component of traditional and alternative medicine, and are often credited with stress-reducing and energy boosting properties. These ethereal oils are often used in aromatherapy, which is a common type of alternative medicine. IndustryARC analysts have assimilated data, analyzed it, and compiled a report which estimates the 2018 essential market size to be between $7 billion- $7.5 billion. The market is also anticipated to grow at a lucrative CAGR of 8%-9% during the forecast period of 2019-2025. Europe will lead the essential oils market geographically with a regional share of 34%-40% owing to a well-established system for essential oils under the supervision of European Federation of Essential Oils. Essential oils are volatile oils extracted from plants, and their rudimentary components. The ‘essence’ of plants in the form of scent and flavor is captured in essential oils, thus preserving what the plants truly constitute. The extraction is performed using several methods like distillation, and solvent extraction. They have been widely employed by the cosmetics industry, and the cooking industry for their natural characteristics, the basis for their successful marketing. These oils are constantly under the research lens for reassessment of their practical uses, while discovering new purposes at the same time. For instance, researchers recently discovered that adding a drop or two of essential oils can prevent microbial growth in food. In a similar fashion, essential oils have found their primary application in the food industry. This segment is anticipated to grow with a noticeable CAGR of 6%-7% during the forecast period of 2019-2025. Essential oils have found a secure purpose in the food and beverage industry. Instead of adding herbs, and juices directly, a drop or two of essential oils is being used to enhance the flavor of a dish. This helps in accentuating the needed flavor, while preserving the need for increased usage of herbs. A flavoring and preservation agents profile leads to robust essential oils market growth. Aromatherapy is one of the most prominently recognized forms of alternative medicines, and uses essential oils as its primary component. Essential oils offer a plethora of uses including relaxation, stress reduction, curing headaches, boosting energy, preventing dementia, and strengthening immunity. The process involves inhaling the essential oils, to which our bodies respond positively by absorbing the essential nutrients. Massaging the oil on sore muscles is also a part of aromatherapy. The western countries employ these ethereal oils in aromatherapy parlors which fuels the growth of the essential oils market. Modern medicine is the exact opposite of essential oils, and relies on conclusive studies performed by learned researchers. The benefits of essential oils on the other hand, are dependent on traditional praise that has been passed down from generation to generation. This is a challenge faced by the essential oils market as it highly relies on the placebo effect as its concrete backing. Evidential research is the only way to combat this challenge, and increases market revenue. Young Living Essential Oils is the leading player in the global essential oils market, and sell a plethora of products, the primary one being Orange oil. 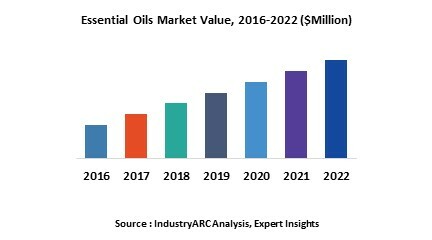 Orange oil also happens to be the leading segment of the essential oils market with a global CAGR of 6%-7% during the forecast period of 2019-2025. According to the analyst at IndustryARC, other leading players in this market are doTerra, Biolandess SAS, Essential Oils of New Zealand, The Lebermuth Company, NOW Foods, India Essential Oils, and Flavex Naturextrakte GmbH. Essential oils market players are making sure that they run their products under a proper sourcing standard in order to enhance sales in the market by offering evidential product descriptions. In collaboration with proper research labs, they are testing their products in compliance with a standardized set of sustainability norms that protects the environment, while boosting essential oils market growth at the same time. This trend will disrupt the market in positive ways, and be applied by a number of other key players. The base year of the study is 2018, with forecast done up to 2025. The study presents a thorough analysis of the competitive landscape, taking into account the market shares of the leading companies. It also provides information on unit shipments. These provide the key market participants with the necessary business intelligence and help them understand the future of the Essential Oils Market. The assessment includes the forecast, an overview of the competitive structure, the market shares of the competitors, as well as the market trends, market demands, market drivers, market challenges, and product analysis. The market drivers and restraints have been assessed to fathom their impact over the forecast period. This report further identifies the key opportunities for growth while also detailing the key challenges and possible threats. The key areas of focus include the types of cheese in the Essential Oils Market, and their specific applications in different areas. Essential oils market can be segmented on the basis of application and product. On the basis of product, the market can be bifurcated into orange, corn mint, eucalyptus, citronella, peppermint, lemon, clove leaf, lime, and spearmint. Based on product, the market can be divided into medical, food and beverage, spa and relaxation, and cleaning. 1. Is the market for Essential Oils growing? How long will it continue to grow and at what rate? 2. Which type of Essential Oils presents the major growth opportunities? 13. What is our Vision 2030 for Essential Oils Market?